<p style="margin-top: 0; margin-bottom: 7px;">Today’s legal professionals must stay up-to-date on all the latest developments in their practice areas. But it can be fun to look back in time to learn what life and laws were like in a completely different era. </p><p style="margin-top: 0; margin-bottom: 7px;">Ever wondered where the first written legal code came from? Or what a legal proceeding may have looked like? 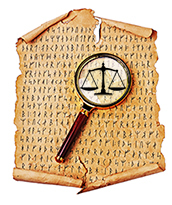 Here are a few legal history tidbits from some well-known ancient empires. <ul style="margin-top: 0; margin-bottom: 7px;"><li>The oldest known code of laws is the Code of Hammurabi, a Babylonian king who ruled around 2100 B.C. </li><li>In cases of a purely religious nature, the church administered the law via ecclesiastical courts located throughout the empire. <ul style="margin-top: 0; margin-bottom: 7px;"><li>With roots in the 11th century B.C., China’s legal system is the oldest continuously operating one in the world. </li><li>Confucius served as a judge as well as a minister of justice. <ul style="margin-top: 0; margin-bottom: 7px;"><li>Parties in a suit represented themselves without the assistance of legal advocates. </li><li>Looting tombs was regarded as the very worst crime in ancient Egypt. <p style="margin-top: 0; margin-bottom: 7px;">When it comes to determining the future of health law, employment law, and the areas where they intersect, all of the predictions and opinions being tossed around can seem confusing and even conflicting. <p style="margin-top: 0; margin-bottom: 7px;">While it has in fact been a long, cold, lonely winter, warm and sunny weather is back. You might even say, “With a vengeance.” While some of us relish the feel of warm rays on our skin, others of us start to tremble with the knowledge that sunburn is in our future. </p><p style="margin-top: 0; margin-bottom: 7px;">The Food and Drug Administration regulates broad-spectrum sunscreen, and in recent years has revamped the required labeling and testing to help clarify things for consumers. Even with these changes, there are some prevailing myths surrounding sunscreen that could prove dangerous to your health.<sup style="font-size: 12px; line-height: 0; ">12</sup> See if you can tell which of the following statements are false. </p><p style="margin-top: 0; margin-bottom: 0px;"><strong>The higher the SPF in the sunscreen, the longer it provides protection. </strong></p><p style="margin-top: 0; margin-bottom: 7px;"><em>False: The SPF rating refers to the product’s ability to filter out UV rays, but you should reapply all sunscreen every two hours no matter the SPF. If you are exposed to water or are sweating, reapply more often. </em></p><p style="margin-top: 0; margin-bottom: 0px;"><strong>Once you have a tan, you can skip the sunscreen and not get burned.</strong> </p><p style="margin-top: 0; margin-bottom: 7px;"><em>False: Tans are actually a sign of skin damage and provide about the equivalent of SPF 4. </em></p><p style="margin-top: 0; margin-bottom: 0px;"><strong>Expired sunscreen is less effective.</strong> </p><p style="margin-top: 0; margin-bottom: 7px;"><em>True: The protective ingredients in sunscreen degrade over time with most having a shelf life of 2-3 years.</em> </p><p style="margin-top: 0; margin-bottom: 0px;"><strong>Certain chemicals in sunscreens make them as dangerous as UV rays, if not more so. <p style="margin-top: 0; margin-bottom: 7px;">Our popular booklet on healthcare decisions, <em>A Gift to Your Family: Planning Ahead for Future Health Needs in Wisconsin</em>, has been around for 20 years. Now, new editions are available for Minnesota and Illinois residents, too. The new versions have been carefully reviewed by Minnesota and Illinois lawyers for accuracy. </p><p style="margin-top: 0; margin-bottom: 7px;"><em>A Gift to Your Family</em> is an ideal tool for helping your clients and community members start the conversation about important end-of-life decisions. <strong>Now through June 30 save 20% off (plus shipping) when you use discount code CP1029BB</strong>. </p><p style="margin-top: 0; margin-bottom: 7px;">To order, simply call (800) 728-7788 or use discount code CP1029BB when ordering online. You can also add your firm name and contact information to the back of each booklet for an additional fee. Call us for details. <p style="margin-top: 0; margin-bottom: 7px;"><img src="http://images.wisbar.org/Images/DigestEmails/WLRD_2018-175.jpg" alt="" width="125" align="right"/>This convenient print reference comes in handy any time you need to find the right attorney, firm, or legal resource – no computer necessary. 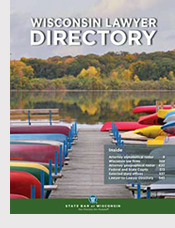 <p style="margin-top: 0; margin-bottom: 7px;">Pre-order your copies of the 2017-18 <em>Wisconsin Lawyer Directory</em> so you can receive the very best price on this valuable book. </p><p style="margin-top: 0; margin-bottom: 7px;">Orders placed by July 31 will receive a pre-publication discount price of $22 for members and their staff, plus tax and shipping. After July 31, copies will be available for $25. The nonmember price is $30. Volume discounts are also available for orders of 10 or more. <p style="margin-top: 0; margin-bottom: 7px;">But first, you’ll need to set up an online account or print out a new card to use at your local Office Depot store.